The flexibility of Linden House really comes into its own when we host a workshop, a training day or act as a team building venue. Between them our four rooms can host sessions for small groups up to larger numbers that need the space to move around and do activities, such as perform role plays or demonstrate a skill or technique such as First Aid. Many workshops, as well as training days and team building, also require separate rooms for breakout sessions, which we can easily provide. Another advantage of our quiet, tucked away location is that the outside grounds, including the riverside open air space, can be used as well. 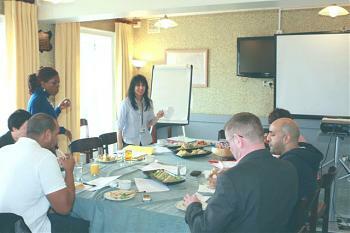 Flexibility of rooms and space, presentation facilities and a helpful and experienced staff all work hand in hand to make Linden House the ideal workshop and training venue in West London. If you have any questions, or would like to arrange a preliminary visit, please contact Hanna or Antonia on 020 8748 1841 or via e-mail. Room layouts (plans and photos). Prices, room capacities, equipment hire etc.